The Young Chefs Program, which was co founded by second year MCO PhD student Vayu Maini Rekdal from the Balskus Lab, recently participated in events designed to exhibit the intersection of science and cooking. Two of the events occurred on campus, while the third took Rekdal and his colleagues all the way to the White House. Rekdal joined other scientists, community leaders, musicians, and artists from across the country on October 3rd for the first ever South by South Lawn (SXSL) event, hosted by President Obama. Rekdal was invited to participate alongside former White House pastry chef Bill Yosses and the after-school urban agriculture program Green Bronx Machine. The event was intended to promote civic engagement and innovation in a number of areas, and included interactive exhibits like the Young Chefs lesson plans. The Young Chefs Program is dedicated to demonstrating scientific concepts through food preparation, and Rekdal brought a couple of the program’s popular lesson plans to the White House. Back at Harvard, Rekdal helped organize the first annual cooking-science challenge, which pitted PhD students from different departments against each other in an Iron Chef style competition on October 23rd. Rekdal was aided by Sam Carlson (G2, MCO), Alec Walker (G2, Immunology), Alexa Jackson (G2, ChemBIo), and Constantin Giurgiu (G2, CCB), and funding came from the Harvard Integrated Life Sciences (HILS) program. Some of the contestants’ creations included miso chocolate pudding, empanada with miso in the dough, miso caramel creme brûlée, and summer rolls with miso emulsion served in a falcon tube. Finally, Rekdal and Yosses presented their work with the Young Chefs Program and Kitchen Garden Laboratory at the School of Engineering and Applied Sciences’ 2016 Science and Cooking public lecture series. 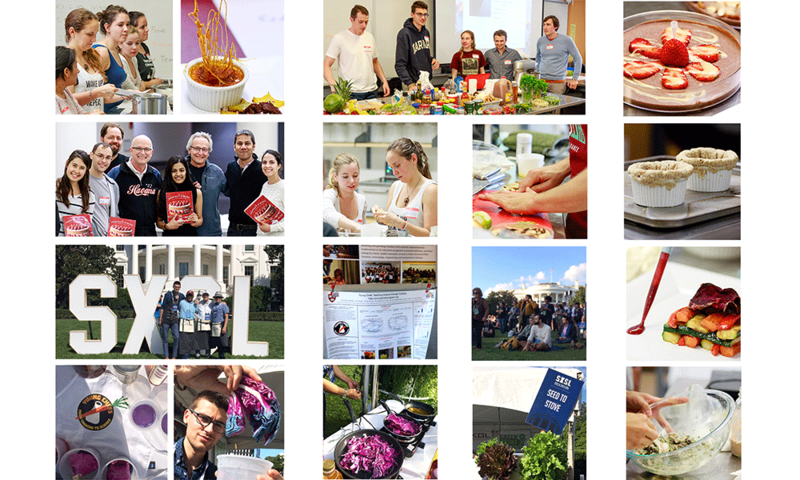 “Three hundred people showed up and learned about topics such as pH, the sense of Taste, viscosity and elasticity, and how we use cooking to engage students with these concepts around the world!” said Rekdal.